In conjunction with the exhibition IMPLICIT TENSIONS—MAPPLETHORPE NOW, the Guggenheim presents a series of Robert Mapplethorpe screenings every Tuesday in February, beginning with a documentary featuring Mapplethorpe’s patron and lover Sam Wagstaff. Tuesday, February 5, at 6 pm. Tuesday, February 12, at 6 pm. 1071 Fifth Avenue (at 88th Street), New York City. From top: Norman Seeff photograph of Patti Smith and Robert Mapplethorpe; Marcus Leatherdale photograph of Mapplethorpe; Sam Wagstaff and Mapplethorpe, portrait by Francesco Scavullo, image courtesy of Sean Byrnes, the Scavullo Foundation, and the Motion Picture Group, Inc., Philadelphia. This entry was posted in ART, FILM, PHOTOGRAPHY and tagged Implicit Tensions—Mapplethorpe Now, patti smith, Robert Mapplethorpe, Sam Wagstaff, Solomon R Guggenheim Museum on February 4th, 2019 by Barlo Perry. MORE FOREVER—a new dance collaboration between Caleb Teicher and composer-pianist Conrad Tao—will be performed three times next week in New York. Sunday, January 6, at 3 pm and 7:30 pm. Monday, January 7, at 7:30 pm. From top: Caleb Teicher (left) and Conrad Tao, photograph by Em Watson; More Forever; Tao and Teicher. Images courtesy the artists. This entry was posted in DANCE, MUSIC, PERFORMANCE and tagged Caleb Teicher, Caleb Teicher & Co., Conrad Tao, More Forever—Caleb Teicher & Co. with Conrad Tao, Solomon R Guggenheim Museum on January 3rd, 2019 by Barlo Perry. The collection of Sylvio Perlstein comprises twentieth-century art movements—from Dada and Surrealism to Abstraction, Land Art, Conceptual Art, Minimal Art, Pop Art, Op Art, Arte Povera, Nouveau Réalisme, Conceptualism, and Contemporary Art—as well as a “collection within the collection” of photography. The catalogue A LUTA CONTINUA—THE PERLSTEIN COLLECTION is out now, and includes essays by Luc Sante, Matthieu Humery, and curator David Rosenberg. (Zürich: Hauser & Wirth Publishers, 2018). Barbara Kruger, Untitled (Busy going crazy), 1989. Courtesy the artist. Vanessa Beecroft, Untitled (performance, detail, Solomon R. Gugghenheim Museum, New York), 1998. Eugène Atget, Boulevard de la Villette 122, 1924 – 1925. Matte albumen silver print. Man Ray, The Bald Patch, 1919. Silver Print. © 2018 Artists Rights Society (ARS), New York. This entry was posted in ART, BOOKS/PERIODICALS and tagged A Luta Continua—The Perlstein Collection, Barbara Kruger, David Rosenberg, Eugène Atget, Hauser and Wirth, Hauser and Wirth Publishers, Luc Sante, Man Ray, Matthieu Humery, Solomon R Guggenheim Museum, Sylvio Perlstein, Vanessa Beecroft on December 18th, 2018 by Barlo Perry. Peggy Guggenheim insisted that her collection remain intact in Venice every year between Easter and November 1st, the period when Venice receives its greatest number of visitors, and which coincides with the biennale. But this summer, key artwork from Peggy’s holdings are at the Guggenheim Museum in New York City, where they join works collected by the original contributors to the Guggenheim Foundation—artist and curator Katherine Dreier, dealer Karl Nierendorf, artist Hilla Rebay, gallerist Justin K. Thannhauser, and industrialist Solomon Guggenheim—in VISIONARIES: CREATING A MODERN GUGGENHEIM. Brâncuși, Pissarro, Duchamp, Picasso, Calder, Klee, Mondrian, and Pollock are all represented, with a special emphasis on the work of Kandinsky. VISIONARIES: CREATING A MODERN GUGGENHEIM, through September 6. SOLOMON R. GUGGENHEIM MUSEUM, 1071 Fifth Avenue, at 88th Street, New York City. Upper two: Exhibition catalogue, edited by Megan Fontanella; and Oskar Fischinger, Untitled, 1942. Image credit: Solomon R. Guggenheim Museum. 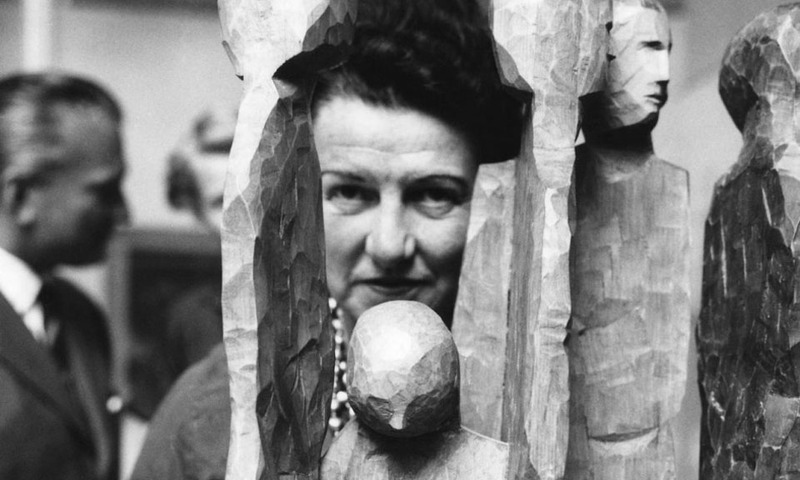 Bottom: Peggy Guggenheim. This entry was posted in ART, BOOKS/PERIODICALS and tagged Alexander Calder, Camille Pissarro, Constantin Brâncuși, Hilla Rebay, Jackson Pollock, Justin K. Thannhauser, Karl Nierendorf, Katherine Dreier, Marcel Duchamp, Megan Fontanella, Oskar Fischinger, Pablo Picasso, Paul Klee, Peggy Guggenheim, Piet Mondrian, Solomon R Guggenheim Museum, Solomon R. Guggenheim, Wassily Kandinsky on July 7th, 2017 by Barlo Perry. 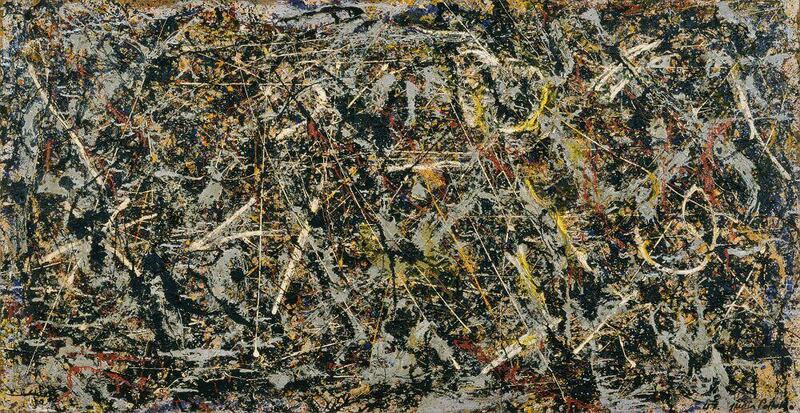 ALCHEMY (1947), by Jackson Pollock, has not been seen in the United States for nearly half a century. Now on loan from the Peggy Guggenheim Collection in Venice, ALCHEMY is on view at the Guggenheim in New York through September 6, 2017. Jackson Pollock, Alchemy (1947), Oil, aluminum, alkyd enamel paint with sand, pebbles, fibers, and wood on canvas. This entry was posted in ART and tagged Alchemy (Pollock), Jackson Pollock, Peggy Guggenheim, Solomon R Guggenheim Museum on June 21st, 2017 by Barlo Perry.